The N.K.1 is the first neck knife produced by Extrema Ratio, which completes the tactical knives series made by the famous brand from Prato (Italy). In times gone by, the American Indians were definitely pioneers in neck knife carry, since they always worn blades around the neck, fastened through sheaths made of leather and other natural materials (such as shown in paintings of the colonial period depicting Sioux Chippewa). Coming back to the present, market deployment of this kind of products in the late 90’s is mainly due to the introduction of the sheaths made of synthetic materials, which have allowed and facilitated the wearing of the knife in a reverse position.Before being manufactured on a large scale, these products were designed and produced by many knife makers (amongst whom we especially remember Newt Livesay and Nealy Dozier). Neck knives, in the modern conception, are small tactical fixed blade knives that are worn around the neck thanks to a sheath (made of synthetic materials) tied to a cord or chain which places the knife ideally at the height of the sternum - in order to make knife ready to be easily accessed and extracted. This way of carrying a knife is a viable alternative when the clothing does not allow the use of the pocket clip or a belt adaptation. In Countries where knife carrying allowed, neck knives are extremely popular with women (especially in the USA), by joggers and by military operators as a tactical tool for personal defense, as they can be well concealed. 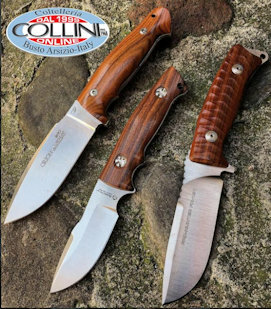 More frequently, for non-professionals operators, these knives are worn in a visible way so as to avoid legal problems in any jurisdiction that does not allow the concealed carrying of a weapon (such as in some American States, like California, where fixed blade knives can be carried - often with restrictions related to blade length - provided they are clearly exposed). 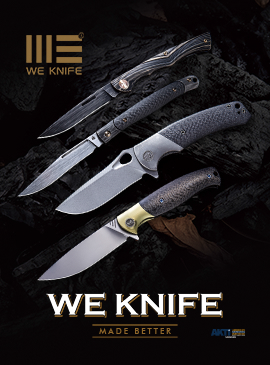 Given the peculiarities of wearing around the neck, this type of knife must fulfill certain requirements, such as: reduced size (both in terms of thickness and length) and lightness, whilst at the same time maintaining effectiveness and comfort. It is therefore a knife that should be considered as an "extra" tool, and that clearly cannot fully substitute the performances that other kinds of tactical knives normally offer. The NK1 produced by Extrema Ratio is a small monolithic knife made of Bohler N690 steel, hardened to 58 HRc, with stonewashed finish (but also available with burnishing or, since July 2014, with desert warfare finishing), whose design was obtained from the Extrema Ratio Skinner knife (supplied with the model Culter Venatorius). Overall the knife measures 129 mm in length, with a blade 47 mm long and 3 mm thick with hollow grinds. The cutting capacity has been tested, in a qualitative way, on some materials (paper, cardboard, mooring ropes, etc..), showing a moderate sharpness of the product. Clearly the difficulty of gripping a knife of this kind (not for an intrinsic limitation of this specific product, but in general for small size knives), does not easily allow to cut all kind of materials. My personal view is that for this kind of knives, it would be better a bit longer blade - both from personal defence point of view, and to give greater versatility to the product. The handle, 6 mm thick, has a slightly curved shape to improve the ergonomics of the product, which is further optimized with the creation of a depression on blade spine for thumb or index positioning, depending on the kind of grip, and a lightening milling on both sides of the handle, which show the typical design of Extrema Ration's fixed blade knives. The back of the handle is marked with the Company name,an aesthetically valuable choice, while - on the other side - there is the product serial code, and on the bottom the handle features a large lanyard hole. The weight of 56,5 grams may seem excessive related to size of the NK1 but, actually, after putting it around your neck you realize that is almost imperceptible. There are products on knife market of similar size that are definitely lighter than the NK1 but, on the other hand, consideration should be given to the NK1 monolithic structure which guarantees a remarkable robustness. NK1 is provided with a kydex sheath with a pressure retention system conformed onto the handle millings, which allows excellent knife retention, but also a quick and easy extraction. The sheath is also equipped with paracord for wearing around the neck, but it can also be used for MOLLE system adaptation. Extrema Ratio has devoted particular attention to the various sheath configuration: indeed, you can purchase separately two other types of sheath adapter. The first one is the Belt-clip, which offers the advantage of placing the knife on the belt in a simple way and without having to unfasten it. The adapter opening takes place through a button release with a safety spring (this is because the opening button is placed in the inner part of the belt). The belt-clip can be adjusted according to the belt thickness and can also be used on backpacks, and so on. The other one, is the inside pants adapter (like gun holsters) which allows you to place the sheath inside the pants, thus giving the possibility to hide the knife under clothes for concealed carrying. In conclusion, the Extrema Ratio's N.K.1 is a compact and sturdy knife that can satisfy every kind of carrying configuration (thanks to the multitude of sheath adapters available), not only for those people who have operational needs but also for those who just wish to have with them the N.K.1 on a daily basis.